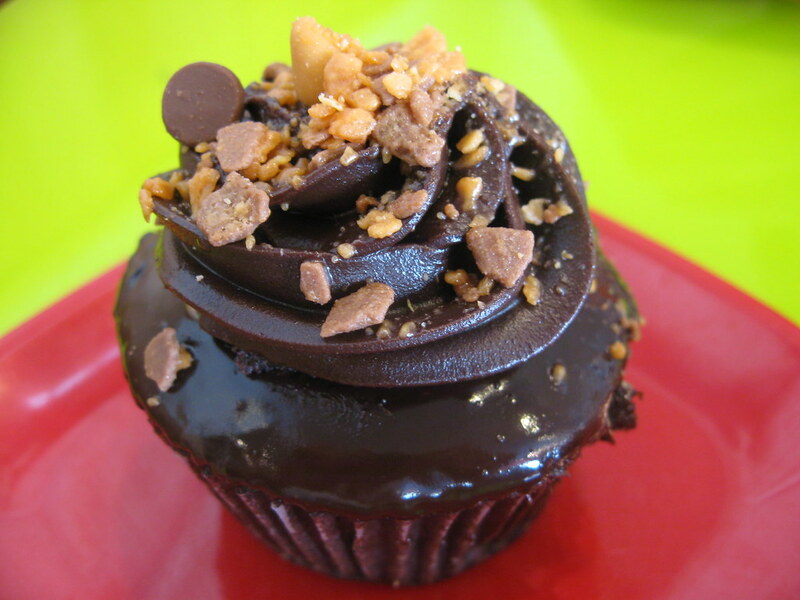 Kristina at The Chocolate Peanut Butter Gallery has written one of the most thorough cupcake reviews I've ever seen of the Ron Bennington chocolate peanut butter cupcake at Molly's Cupcakes in Chicago. Click above to see the amazing assortment of ingredients. The filling: The peanut butter filling didn’t taste like there was any sugar or butter mixed in, as is the norm with most peanut butter fillings and icings. If there were other ingredients, they did a great job hiding it because it tasted very, very peanut buttery. I’m a little confused by the cupcake’s description - it looks like it says PB & Butterscotch filling, but I could have sworn they were filled with straight peanut butter. Whatever the case, the filling was great. The ganache: The ganache topping was wonderfully chocolatey and thick. One thing that’s hard about loving very dark chocolate is that most of the time when I order a dark chocolate dessert from somewhere, it’s too sweet, and not dark / bitter enough. Half the time I need to chase my dessert with a bite of real dark chocolate to satisfy my sweet tooth, which is sad. But halfway into this cupcake I was ready for a glass of milk and a nap. It was awesome. The cake base: The sole complaint I have about the Ron Bennington is that the cake itself was a teeny bit dry. I still don’t know what Misha’s Cupcakes does to their cupcakes, but theirs are just so freaking moist. To review this cupcake, I tasted all of the elements individually - the cake, ganache, filing - and then took big bites, tasting the cupcake as a whole. When eaten together, you don’t notice the dryness of the cake because the super creamy ganache and filling balance it well. But a bite of the cake on it’s own was just okay, nothing spectacular. I’m not going to get to petty about this though. On the whole, it was an incredible cupcake. Maybe it doesn’t quite get the A+ but definitely an A / A-. Bravo, Molly!